Residential barn doors have a long, celebrated lineage. Even faux barn doors made of solid, attractive wood lend a rustic appearance to your home. And they're functionally spectacular, opening wide for deliveries and large groups of visitors. Sturdy tiles and cross frames provide excellent reinforcement as well as lend a functional, bucolic appearance. Strikeplates protect the sill in all types of weather and heavy use. Carved wood leaves a lasting impression on your guests. Most of all, the cast-metal leonine knobs add traditional, European charm against the plain vertical stripes of light-colored wood. 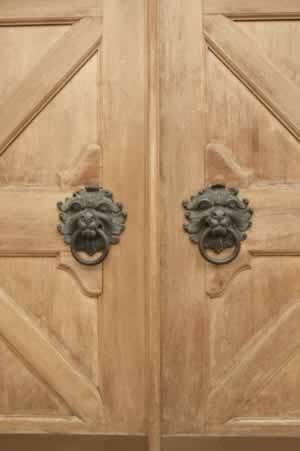 It's the brawny panels of the wooden door that lend themselves to a wide range of hardware treatment. It depends upon your decor, whether Italianate, vintage American, or country and farmhouse design. With a door this powerful, you open your range of hardware to create a brawny look that's never extreme. Fine woodwork is its own reward.